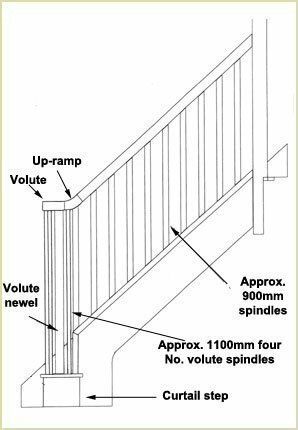 The volute is available as left or right hand forms and is supplied with an up-ramp (not fitted). 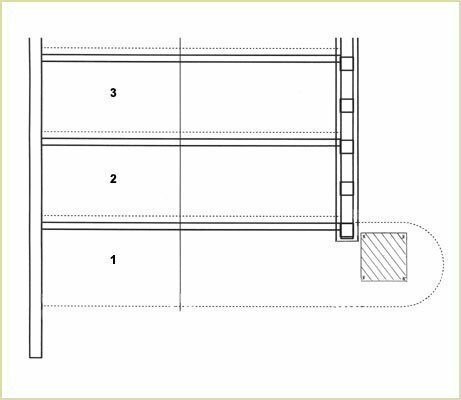 There are four 1100mm spindles used in conjunction with the volute and the volute newel. 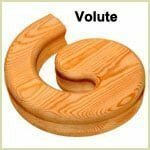 The first stage of building the volute is to fit the up-ramp to the volute. 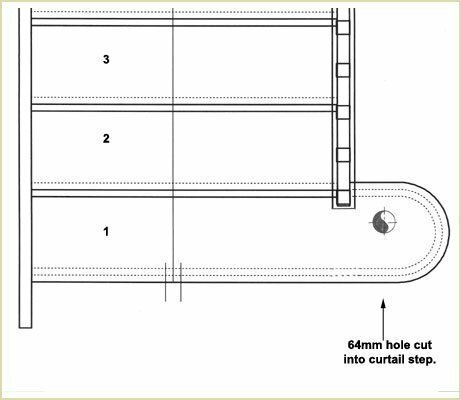 The up-ramps are supplied overlong to suit the majority of staircase pitches and will need to be cut down to suit individual requirements.First, join the overlong up-ramp to the end of the volute using a dowel screw set. 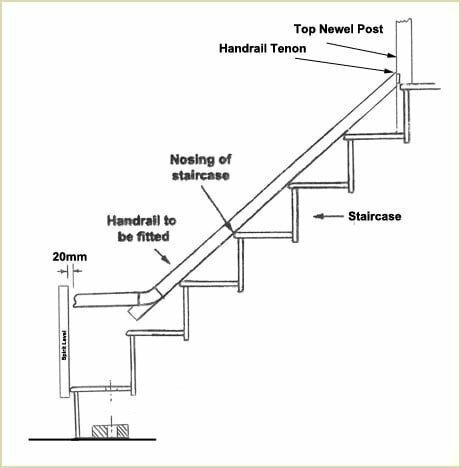 (See Install Handrail on home page). The overly long up-ramp needs to be cut down. 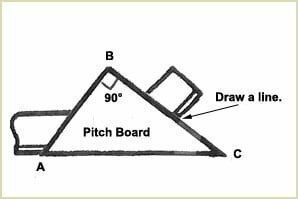 To do this you must first make a pitch board which is a triangular piece of ply wood with the sides the same rise, going and pitch as a single step of the stairs, see below. 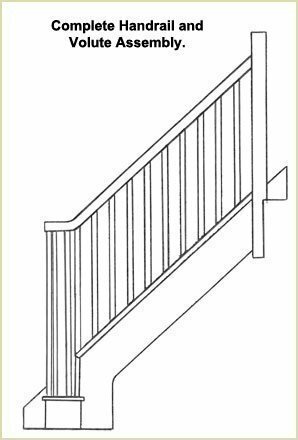 Place the volute and handrail assembly onto a flat surface and offer the pitch board to the underside of the up-ramp. 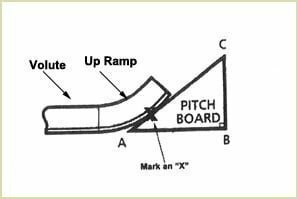 At the centre where the hypotenuse of the pitch board touches the ramp mark with a pencil 'X' on the up-ramp. 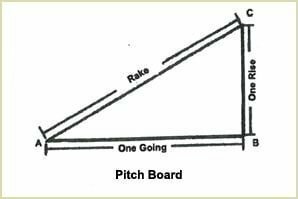 Reverse the pitch board and align the marked point 'X' on the up-ramp with the B - C axis. 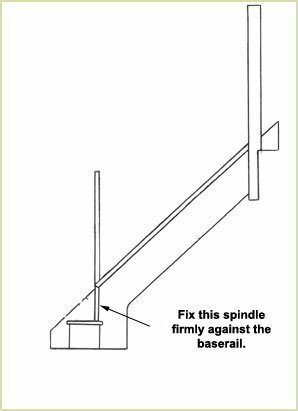 Scribe a pencil line onto the up-ramp to give the angle of cut. 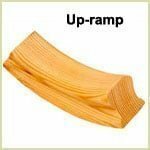 Cut the up-ramp through this line to leave you with a finished volute and up-ramp assembly. The next stage is to fit the volute newel to the curtail step. 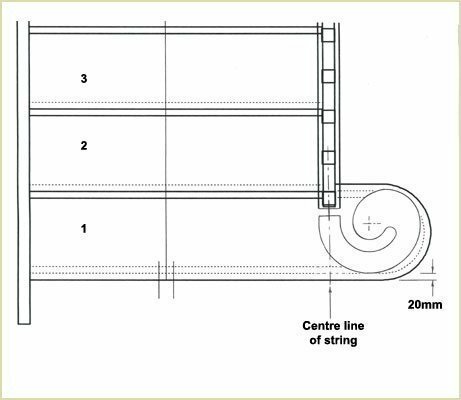 See the drawing below for a side elevation of the volute inside the curtail step. 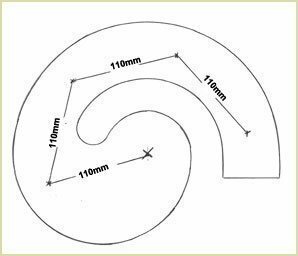 To do this you need a template of the volute. 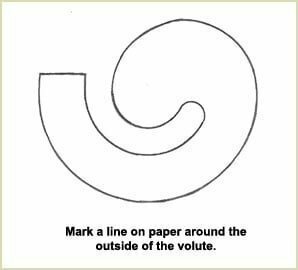 If you don't have one then take a piece of paper and simply draw around the outside edge of the volute. 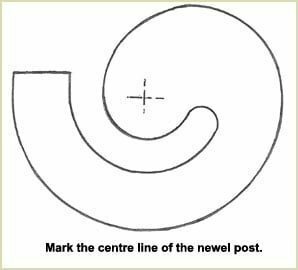 Turn the volute and the paper upside down and mark the centre line of the newel hole. Put a small hole through this point so you can mark the centre line on the reverse of the paper. 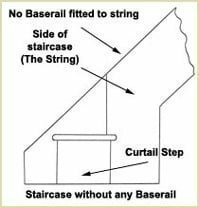 Place this paper template onto the assembled curtail step, 20mm from the front of the step and the centre line of the string of the staircase. Bradle the centre point of the volute into the curtail step. You can now drill a hole the same size as the volute. Our volutes, at the base, are 64mm. Drill a hole using an arbor and 64mm cutter. 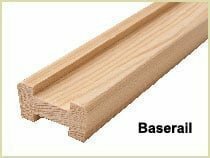 Use these two, assembled to cut the 64mm hole in the curtail step. To look at purchasing these parts click this button. See below for the finished hole. 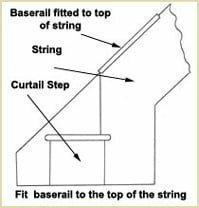 Put the curtail step temporarily into place and mark around the base of the curtail step with a pencil and then remove the curtail step. Fix, temporarily, the large wooden block roughly where the centre line of the newel post is on the floor. 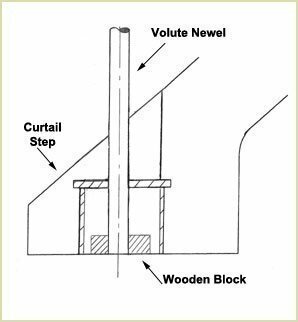 Take the bottom of the newel post, drive a screw into the centre of the newel and grind the screw to a point. 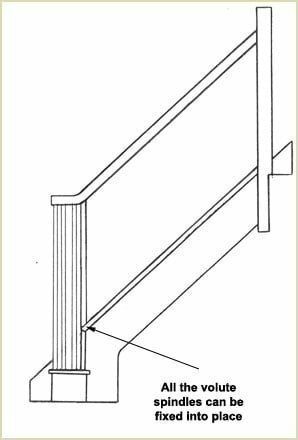 Put this newel back into the curtail step and when the newel is completely vertical (check with a spirit level), tap the top with a hammer so that it leaves an impression. Remove the screw with mole grips. 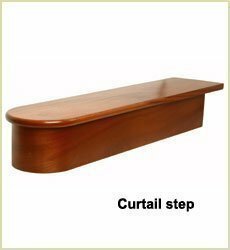 Also remove the curtail step. 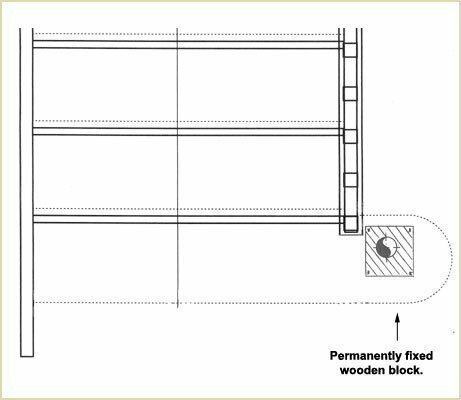 Draw around the wood block, then remove the temporary fixings and drill a 64mm hole, as above, through the wooden block. 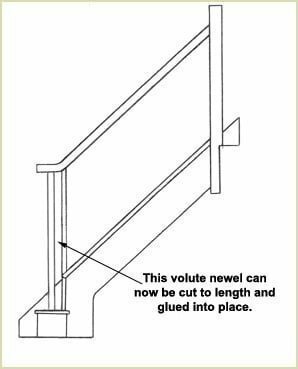 Please Note - Do not glue the volute newel into position yet. 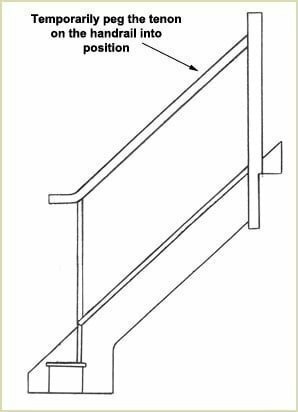 You now need to cut the handrail to the correct length. 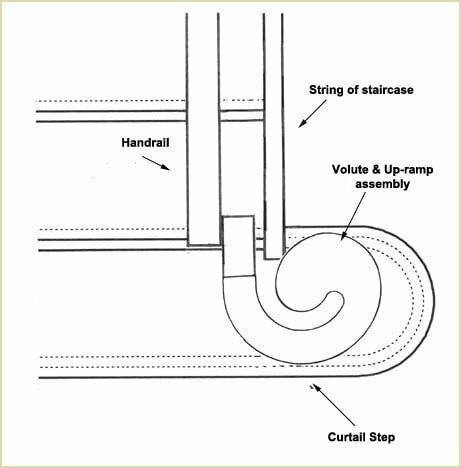 Take the volute and up-ramp assembly and place it against the handrail in exactly the correct position i.e. 20mm from the front edge, put a spirit level up against the front edge of the curtail step. Make sure the volute is also level, put a spirit level on this as well. See below again for a plan view of this marking out arrangement. 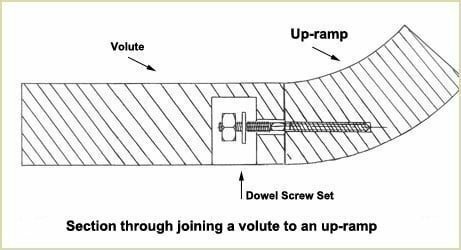 You should be able to now join the volute and up-ramp assembly directly to the handrail using a dowel screw set. 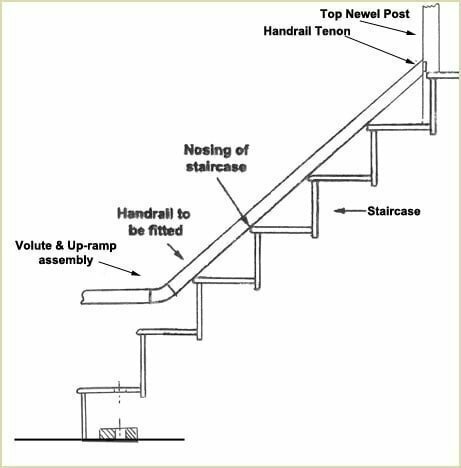 (See Install Handrail on home page). 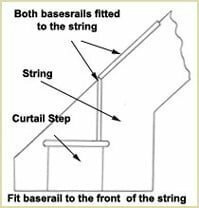 Then you can screw a long spindle against the string as a very secure method of fixing. 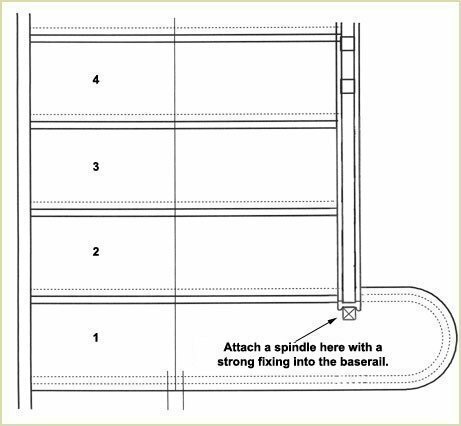 Below is a plan view of the end spindle fixed. And below is a side elevation of this same arrangement. 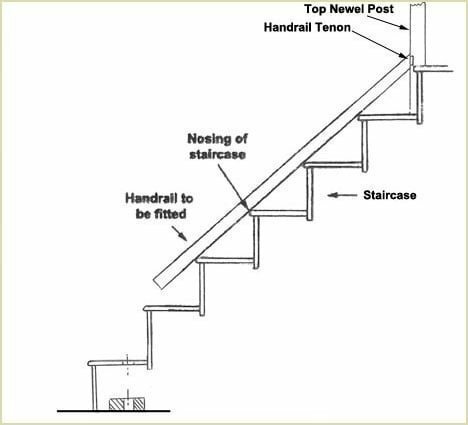 You can now temporarily peg the handrail into position. 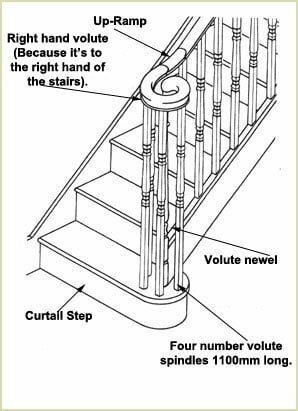 Measure the height of the volute newel and saw the bottom of the volute newel to the correct length. This volute newel can now be glued into place. 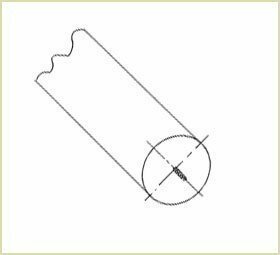 The four volute spindles can be cut to length but first the spindles can be marked into position as below. These are simply 110mm from centre to centre or as it pleases your eye. 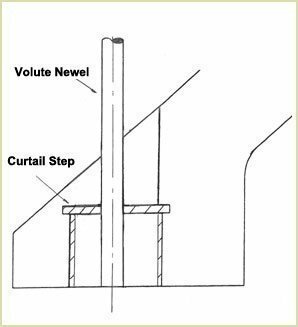 The volute spindles can be attached either by stub tenoning them on the top and bottom shoulders OR they can be drilled and dowelled top and bottom. All the spindles along the string can now be fixed into place for a complete handrail and volute assembly. 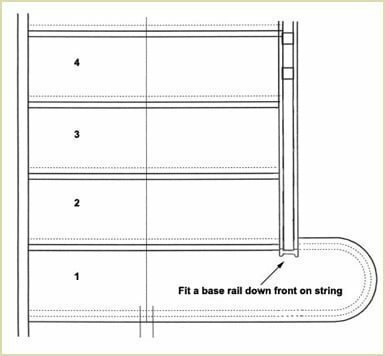 This completes one of the most difficult on site installation processes that you can find on a staircase. 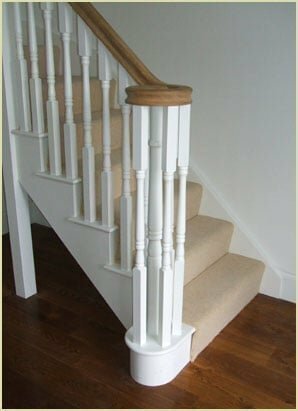 However, if you follow the above instructions you should have a very strong and beautiful looking volute staircase.